What Causes Low Back Pain and Neck Pain? Back pain or neck pain can severely limit one’s ability to function in everyday life and often causes great anxiety that a serious threatening condition may have arrived. Fortunately for the vast majority of those afflicted, no surgery will be necessary usually and there is often a good recovery with conservative measures. The patient and doctor must work together in understanding the mechanism of the pain affecting the patient to effect the best treatment plan. Traditionally it was once believed that low back pain especially if it was severe was due to pressure on the cauda equina or the spinal cord. However studies over the past twenty years have shown there are pain receptors in the facet joint and it’s capsule, disc, muscles and even bone which can cause back pain. Somatically these are poorly locatized to primitive pain centers in the brain which localize to the back, hip or leg in a poorly defined area similar to radiculopathy which is the classical pain associated with nerve compression. Aging changes to the facet joints, chronic inflammation, infection, tumor, or trauma can lead to this pseudoradiculopathy. Characteristically it is not associated with neurological deficit or straight leg raising sign which are findings suggestive of nerve root compression. These receptors are stimulated or altered by biochemical factors including cytokines such as matrix metalloproteinases, phospholipase A2, nitric oxide, and tumor necrosis factor-alpha are thought to contribute to the development of low back pain. Inflammatory responses and sensitivity changes to these substances can occur with repetitive motion. Cox-2 inhibitors such as nonsteroidal anti-inflammatory drugs have been shown to be more effective than acetopminophen in helping to relieve pain. Additionally neurophysiological mechanisms exist in the midst of stress and/or depression, for example, which can mediate or amplify pain responses. Nerve root inflammation with and without direct mechanical irritation of the spinal nerve roots in the lumbar spine is thought to occur from the release of substances leaking from the intervertebral disk including phospholipases, leukotrienes, and thromboxane. Chronic bony stenosis causes an reduction in the blood flow to nerves causing inflammatory responses and neural element ischemia. Theoretically corticosteroids can inhibit this inflammatory response, reduce pathological capillary permeability, and decreasce nociceptive input from C-fibers. This has led to widespread use of epidural steroid use for radicular pain in the United States but studies have been mixed as to the results. Poor technique and patient selection was found to contribute to poor outcomes. Although some report this treatment may temporarily aleviate pain allowing the patient to avoid surgery the evidence of long term benefit is lacking. Recent studies have found that oral administration of gabapentin gave similar results as epidural steroids for nerve root pain or claudication type of pain seen with spinal stenosis. 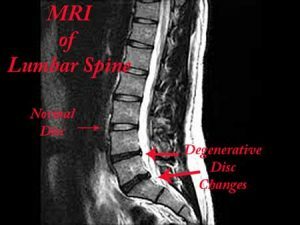 Since the development of MRI and CT Scan, however, it has been clearly recognized that although most the population will have disc degeneration and facet changes beginning in their thirties and progressing through aging this changes do not always correlate with pain. Thus the medical practioner has to be careful about ascribing pain to these changes of aging and patients should avoid fixating on these findings. Injury or inflammation in the soft tissues of the body can cause a release of chemical substances which can incite a further inflammatory reaction which propagates itself locally. Injury to the muscles or tendons connected to the bony elements of the spine can trigger this reaction causing severe spasm of the spine and pain. This type of pain often responds to NSAIDs (Non-Steroidal Anti-Inflammatory Drugs) which can reduce this chemical response and hence bring down the pain. This pains gets worse with weight bearing and movement of the spine. Typically it is limited to the vicinity of the spine and does not radiate to the extremities. Limitation of weight bearing and movement may provide some temporary relief. Like sprains and strains in other parts of the body, the initial period of immobility should be followed by a gradual stretching and strengthening program to facilitate restoration of function. Most often there is no significant anatomical damage to the spine. Patients can be treated conservatively. The spine is a collection of joints supporting the body while at the same time allowing movement. This movement can occur because the the spine is composed of many bones which can move relative to one another in bending, twisting, and extending directions. However, since there are nerves passing between the bones this movement must be safely restricted to prevent compression of the nerves which could cause pain, weakness, numbness or even paralysis. There are two main structures which control this movement. 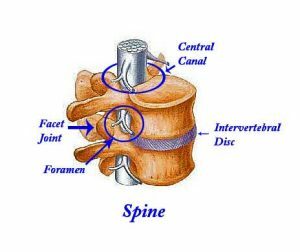 The facet joints are bony plates attached to the vertebrae which block excessive movement in some directions while allowing more movement in other directions. 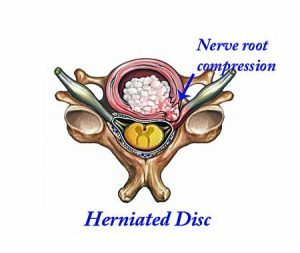 Situated between the vertebrae is a shock absorber, the intervertebral disc, made of a tough outer layer of fibrous tissue and an inner layer of normally well hydrated matrix of protein and carbohydrate. Both the facet joints and intervertebral disc, like other joints in the body can generate pain from tiny sensory nerves that detect injury, inflammation, or aging changes. These nerves are branches of the nerves that go to the extremities so that the brain may read a signal from these nerves as coming from the leg in the lumbar spine or the arm in the cervical spine. Pain in the extremity coming from the facet or disc typically is not as severe as the associated mechanical pain. Thus the neck or low back pain will be worse than the arm or leg pain present. Patients usually report that they cannot localize the pain exactly and it tends not to follow known distributions of nerve sensation called dermatomes. As the nerve itself is functioning normally and just doing its job, clinical examination and testing will not show an abnormality. This type of pain is often associated with tears of the outer disc or soft tissue injury or inflammation of the facet capsule covering the facet. It tends to be long lasting than mechanical pain and may require more intense rehabilitation such as physical therapy and learning to use one’s body properly. For some the onset of this pain may necessitate some permanent life style changes if they are involved in jobs like heavy weight lifting. Surgery for this type of pain is rarely successful in making patients totally pain free. Compression of a nerve going to the arm in the cervical spine or the leg in the lumbar spine can lead to pain radiating from the spine to the extremities. Often this pain will be greater than the pain localized to the spine. Clinical examination of nerve function will often reveal a disturbance in sensation, strength or reflexes. Specific clinic maneuvers such as compression of the head for neck pain or lifting the leg passively for the lumbar spine worsen the pain due to radiculopathy. The spine has two channels through which the neural elements (nerves) pass. There is a large central canal for the spinal cord carrying all nerves from the brain to the rest of body and in between the vertebrae on each side, a smaller channel called the foramen, for the individual nerves going to the arm in the cervical spine and to the leg in the lumbar spine. The spinal cord ends at the upper level of the lumbar spine so that compression of the spinal cord occurs mostly in the cervical and thoracic regions. Compression of the spinal cord (myelopathy) generally results in an increase in reflexes while compression of nerve roots causes a loss or decrease in the reflex of the affected nerve root or roots. If the central canal is involved there will usually be symptoms of both sides of the body including weakness, numbness, or difficulty in controlling urination or bowel movement whereas compression in the foramen (radiculopathy) causes one sided and often single nerve root involvement. Combinations of central and foraminal compression also can occur. The vast majority of adult spine pain patients have degenerative conditions due to aging and repetitive injury from heavy occupations which cause the disks and facet joints to wear out. Rarely these processes may result in nerve compression but usually are limited to causing only mechanical pain or pseudoradiculopathy which do not require surgery. Following a thorough history and physical examination, which does not elucidate any warning signs or neurological involvement most adult patients can safely be treated conservatively for at least a month before undergoing expensive imaging such as an MRI. However, it should be noted that in regions where tuberculosis is endemic it may be wise to go for an x-ray of the spine and an ESR (Erythrocyte Sedimentation Rate), which together approach a 90 percent effective low cost screening for tuberculosis of the spine. Anna on What Causes Low Back Pain and Neck Pain?